Split Seam If the seam has come apart, this can be difficult to fix with repair patches. If you are still within your warranty period, please contact the After Sales team to process a warranty claim. What is a suitable base for the Steel Wall Pool? Almost any completely flat, solid level surface can be used. Do not use sand as leveling material as it is prone to shift under the pool. Do not set up on driveways, decking, platforms, gravel or asphalt. The ground should be stable enough to withstand the weight and pressure of the water. To avoid abrasions and tears, it is recommended to not drag the pool into position. What is the maxium filling levels height of the pool? Fill the pool until the water capacity is at 80%. 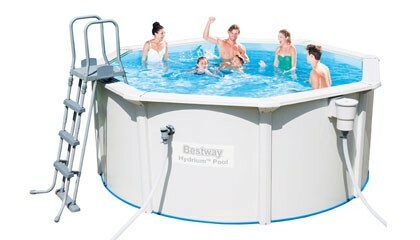 It is recommended to leave some extra space for water displacement for when the pool is in use. This depends on how often the pool is used, and if a filter pump and chemicals are being used. If the water is being maintained with the correct chemicals and filter system, then the water can last the summer season. Why is the colour of the pool fading? This can be caused by excessive chemical use. If this is the case, this is not a manufacturing issue. How can I clean the pool? Do I need to disassemble my pool for the winter? It is recommended that the pool is stored in a cool, dry place across the winter period as the cold weather can damage the PVC walls. How do I drain the pool? Unscrew the valve cap on the outside of the pool and remove.